Saturday is baking day as I prep for church coffee hour. Today I tried a new coffee cake. It is titled Sweet Bread Wreath. It is from Betty Crocker and it came out looking great. I like to do something new every week. That is the game! Ideally it is something that teaches me some new technique or makes me do something different. 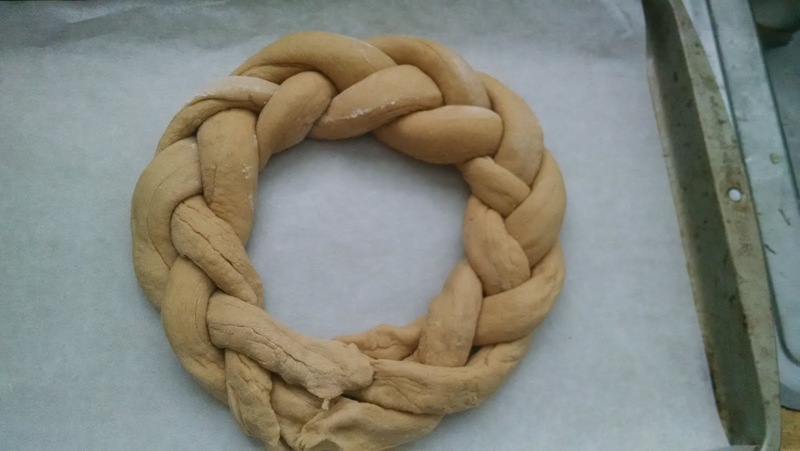 In this case it was making a braided wreath. I had not done that since I made a braided Christmas Stollen a long time ago from the Monastery Cookbook. Now that was a project. One day I will have to revisit that. That was not a wreath. Today's bread was. You had to divide the dough into three pieces and roll them into 26 inch ropes. Then you braided them loosely and shaped them into a wreath. It was all easier than I thought it would be. The wreath was kind of rough at the bottom edge where the ends of the ropes were pinched together. However, I figured, that is where I can cut into it when it is on the coffee hour buffet. If you do not cut into a cake nobody cuts into it and it just sits there. That is what I have learned! Likewise if you do not take the cover off something, be that cover foil or plastic or whatever, experience teaches me that nobody takes the cover off. They might reach under the plastic or foil and take a slice but they do not remove the covering, oh no. Back to the Sweet Bread Wreath which, by the way, you can find the recipe here. I put it in the oven to proof at a balmy 100 degrees and here is how it was after maybe an hour and a half. Eventually it emerged. So pleasingly plump! 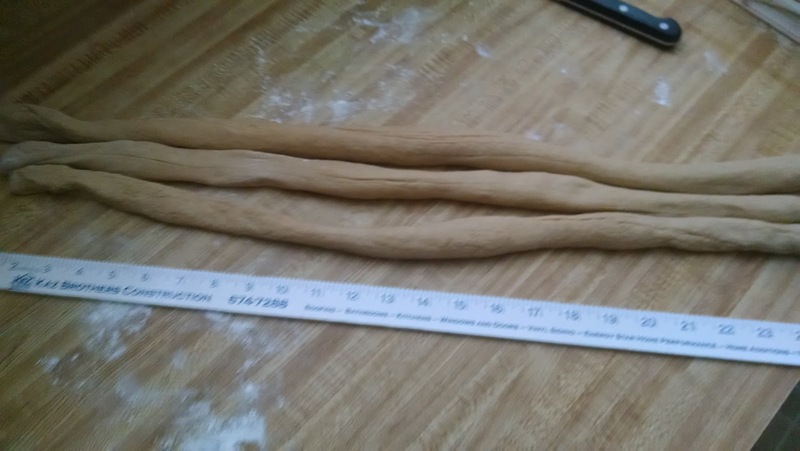 I gave it a lot of time because I used white whole wheat flour. I was out of plain white flour and too lazy to go to Albrecht Discount. 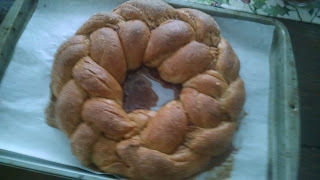 Before it bakes you are to brush the Sweet Bread Wreath with beaten egg and then sprinkle it with spices. Here is where I did not read, and I mixed the spices in with the beaten egg. Oh no. Oh no! I brushed the mixture on as it was, fingers crossed, and into the oven it went. I think I will sprinkle powdered sugar on it immediately before serving. Another lesson I have learned is people like a bit of sweetness but not a load of it. Well, the kids like a load of it, which is why I made brownies as well. But most people don't want anything with too much sugar. Still they like some. They do not want no sugar. You must strike this happy medium. 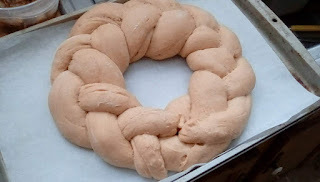 Which I hope I do with the Sweet Bread Wreath. I will try to take a picture tomorrow before Mass so we can see how it looks with its pious dusting of sugar. Meanwhile I have nothing but praise for this particular Betty Crocker cookbook. It is "Come Home To Dinner" and it utilizes your appliances like the bread machine and the Crock Pot. Its bread section is the greatest. I have done a bundle of the recipes and they all work out great. As opposed to this other bread machine cookbook -- this series of cookbooks really -- that I used to use. Here, I found this picture of them. I had three of these books. The breads on the cover look yummy! And they usually came out well. But not after an eon of fussing and tweaking. I would look in the machine and they would be too crumbly or too wet or too heavy and the machine would be huffing and puffing and finally just stop. I was always adding something or amending something but somehow I never blamed the books. I always blamed myself. And at the end when the breads came out well I would write "VG" or "Made for church everyone ate it up" or something like that, and forget about all the work I went through. 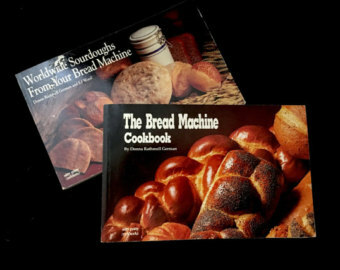 Whereas with this Betty Crocker book, the dough always comes out of the machine perfect and easy to work with, no muss no fuss. 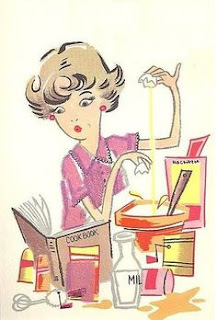 I marveled at it for several weeks until it finally dawned on me: Those cookbooks I used to use were just plain bad. Fie on them! I do not think I will even give them to Amvets. I do not want some other cook baking for her church coffee hour to be pulling her hair out. I think I will just throw them away! Betty Crocker is my new best friend. Sometimes you need someone who has been around since your great-grandparents' era, you know?